We spent some time speaking with the Captain, Andy Isaacson about Andy’s Silver Strike Charter Fishing, whose 31 foot “Silver Strike” Tiara heads out daily from the Baileys Harbor Town Marina. And And'ys' Silver Strike can take you out in Summer, Fall, Winter and Spring too! Andy has been a U.S. Coast Guard Certified licensed Captain since about 1993, and spent almost his whole life fishing in Door County waters. Andy also has a Master’s License, which licenses Andy to drive up to a 150 ton vessel – so this is one experienced Captain. Read on about Andy's Silver Strike! Captain Andy has been doing charters in Door County waters since 1997. Combine all these years of chartering along with practically fishing his entire life in these Door County waters (he’s 5th generation Door County), and you have a Captain with a depth of knowledge that would be hard to find somewhere else. 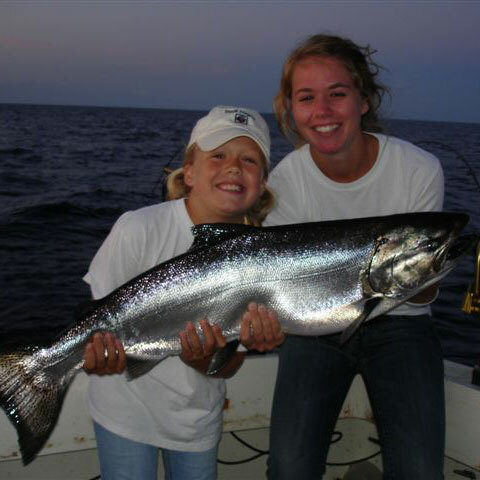 If you want to fish Lake Michigan for Brown Trout, Lake Trout, Rainbow Trout, Steel Head Trout, Chinook Salmon, Walleye or Bass, then Captain Andy knows just where to take you and in what seasons they run best! For the best times to catch which species of fish, check Andy’s Silver Strike website. Growing up here, and loving to fish all his life, the Captain has a natural feel for where the fish are. And they focus on catching fish when they bring people out! They want their clients to go out when the fish are ready to catch – they’ll start at 4 -4:30 in the morning when needed, and they also do sunset trips for salmon (mid-June – September). In short, they will go out when the fishing is prime, and they know exactly when that is! That's the Silver Strike! Captain Andy explains that his 31 foot “Silver Strike” Tiara is a top of the line boat for fishing. The equipment is top of the line – they continuously update their reels and equipment: they have marine – marine radar, auto-pilot, 2 color electronic, fish finders and more - all the newest technology and gear. Combine this with their deep experience, their willingness to go out when the time is right to catch fish, and you have a great one-two combination for a successful and safe fishing adventure. We did ask why the boat is named Silver Strike: they use silver lures, and when you get a hit it’s a strike! So there you go! The Silver Strike is the main boat for the Summer charters. The boat can accommodate 1- 6 people, for a 3, 4 or 5 hour tour with both individual rates and group rates for the 5 hour charter. If you have one or two people and want to be grouped up with other people, then you can go on a per person rate for the 5 hour tour. The 3 and 4 hour rates are the whole boat, on a private charter. In addition, they have a Wallleye and Bass boat too, that runs Spring and Fall charters. Winter and Ice Fishing? No Problem! And you want to ice fish? Well, in the winter Andy's will take you out and be your winter ice fishing guide, operating from the lower bay of Green Bay, to north.of Sturgeon Bay. Check all the details of a winter ice fishing outing, by clicking here: Andy's Silver Strike Ice Fishing info! And don’t worry about the weather or cancellations. You can cancel up to 48 hours from charter time for a full out. And for weather issues, the Captain determines whether the charter goes out. If the Captain cancels the trip, there are no charges. Captain Andy says they get a mixture of families and serious fisherman too – and everyone has fun. One of the Captain’s most memorable outings was when he took a group of 6 out, and they caught 30 fish on the trip in Summer 2005 (and there is a 5 fish limit per fisherman – so they were at their max!). And the he told the story of being out one Sunday evening when a 13 year old caught 28 pound salmon (this would have beat the winner in the Salmon Tournament if it was during the tournament time)! Captain Andy told us that he has one guy who goes out with them 5 times a year! So everyone can have fun aboard the Silver Strike! And When You Catch Fish . . .
Don’t worry about what to do with the fish once you catch them! Andy’s Silver Strike will clean and gut your catch free, or they will take then to a fish market in town which will filet them, freeze and vacuum-pack and even ship them to you (there is a charge for this). Now that’s service! A fishing license, of course, is necessary for each fisherman. You can purchase 2 day licenses. Captain Andy gets a lot of repeat business because of their experience in this area, and their ability to go out at the right time to catch fish when they are best to be caught. They will go out at any time! If you want to catch fish, they know where and when to go. Get all the facts and details - check out Andy’s Silver Strike Charter Fishing right now, and please tell them that DoorCountyNavigator.com sent you - that helps us keep this site alive and well . . . for you!